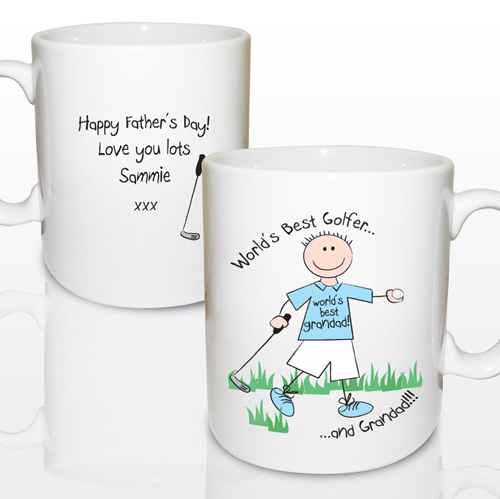 Personalise this World's Best Golfer Mug to create a funky prezzy for your dad, grandfather or husband. This cute mug is the perfect gift to give to any sports fan for Fathers Day, Birthdays or Christmas. The mug reads 'Worlds Best Golfer' will be fixed text on this item and can be adapted for any male relative such as Daddy, Grandad or husband, any name up to 12 characters. 'and' will be fixed text on this item. Personalise for any male relative such as Daddy, Grandad or husband, any name up to 12 characters.